Visitation: Visitation, with family present, will be Sunday, Feb. 10th from 3-5 p.m. at St. Dominic’s. A scripture service will be held at 5 p.m.
Service: Mass of Christian Burial will begin at 10:30 a.m. Monday, Feb. 11th at St. Dominic Catholic Church, Canton, SD. Dorothy Oakland, age 96, passed away peacefully Tuesday, February 5, 2019 at the Good Samaritan Society in Canton. Mass of Christian Burial will begin at 10:30 a.m. Monday, Feb. 11th at St. Dominic Catholic Church, Canton, SD. Visitation, with family present, will be Sunday, Feb. 10th from 3-5 p.m. at St. Dominic’s. A scripture service will be held at 5 p.m.
Dorothy was born on June 27, 1922 near Kimball, SD in rural Brule County to Walter and Margaret (Schmitt) Andrews. She attended Catholic School in Mitchell for three years before moving to Canton, SD in 1931. 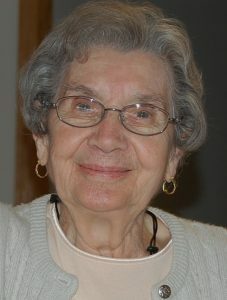 After graduating from Canton High School in 1941, she married Lowell Oakland on January 8, 1945 in Centerville, SD. Lowell died in 2003. Besides raising her 10 children, she worked for Dr. Aker, Dr. Diekman, the Selective Service, and worked 28 years at Bid-Well, retiring in 1991. She was a faithful member of St. Dominic’s, serving on the Altar Society. She enjoyed card clubs, crocheting, cooking, ceramics, playing cards and raising chinchillas. She cherished each and every one of her family members and would always say how blessed she was to have a large family. Dorothy is survived by her children, Linda (Norris) Ekle, Kathy (Gary) Sehr all of Canton, Mike (Rochelle), Pierre, SD, Ralph (Louise) Bristol, SD, Gene (Sonja), Mary (Sterling) Heath, Marsha (Troy) Young, Paul (Jeanne), Pam (Scott) Vongroven, all of Canton, SD and Carol Anderson, Tea, SD; 25 grandchildren; 42 great-grandchildren; 4 great-great-grandchildren; special people who shared in her life, JoAnn Leonard and David Anderson; along with numerous extended family and friends. She was preceded in death by her parents and husband, Lowell. Gene, we are so sorry to hear about your mom. Our deepest sympathy to you and your whole family. Dear Linda, Kathy, Mike, Ralph, Gene, Mary, Marsha, Paul, Pam and Carol, husbands and wives, children, grandchildren, great grandchildren and great, great grandchildren. I so wish I could be there.The best times of my childhood were spent with you kids because of your Mom and Dad. Your Mom was a Mother Teresa to me. She expressed love and kindness with the most gentle manner and had the patience of a saint. My prayer is that you will enjoy the moments of peace when you close your eyes in the quiet of the day or night and be present in prayer with her. She was and is blessed with the spirit of love. Faith in the Lord will lift us up, and the love of your Mom will bring us comfort. My thoughts and prayers are with all of you. I was so sorry to hear about your mother. She was always very sweet to me. She was lucky to have such a large and loving family. My thoughts are with you all. We are sorry for your loss. It is so difficult to lose a cherished member of the family even though we are confident they are in a better place. May the Lord be with you in a special way during this time of sorrow. Sonny and I are thinking of you all after reading in the newspaper about Dorothy’s death. She was a wonderful woman especially a great mother who raised such a great family! She certainly lived her life well to live to be 96 years old! So sorry to hear of the loss of your mother. Cherish your memories and lean on each other for support. Prayers for the family and friends. Heaven received another smiling angel that was everyone’s friend. Mary I am so sorry. My prayers for strength for you and your family.